The country's fiscal deficit touched 134.2 per cent of the full-year revised budgeted estimate at the end of February 2019, mainly due to tepid growth in revenue collections, official data showed Friday. 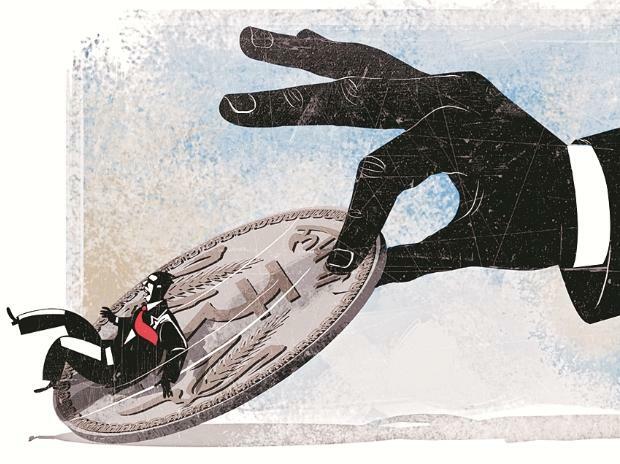 In absolute terms, the fiscal deficit for April-February 2018-19 was Rs 8.51 lakh crore as against the revised estimate (RE) of Rs 6.34 trillion for the entire year, according to Controller General of Accounts (CGA) data. The CGA data revealed that revenue receipts of the central government was Rs 12.65 trillion or 73.2 per cent of the revised budgetary estimate (BE) at February end. In the same period last fiscal, the revenue collection was 78.2 per cent of the estimates. The government's tax revenue stood at Rs 10.94 trillion and non-tax revenue was Rs 1.7 trillion. Total expenditure incurred by the government during April-February 2018-19 was Rs 21.88 trillion (89.08 per cent of RE), of which Rs 19.15 trillion was on revenue account and Rs 2.73 trillion on capital account. Out of the total revenue expenditure, Rs 5.01 trillion was on account of interest payments and Rs 2.63 trillion on major subsidies.